It's National Breakfast Month! And what better way to celebrate than with me, Nellie's Free Range Eggs, a delicious breakfast sandwich recipe, oh... and a giveaway? I'm sharing a recipe today that's perfect for breakfast (because it's National Breakfast Month), but that is hearty enough that it could easily be served for lunch or dinner too! 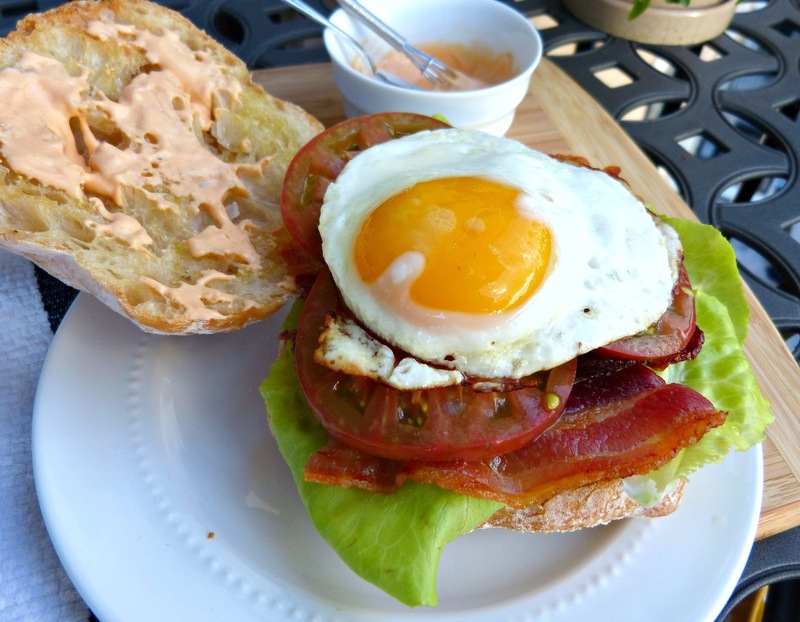 This breakfast-y take on a classic BLT gets a little extra flavor from a few simple additions: a crusty ciabatta roll, a zesty homemade sriracha mayo and a sunnyside up Nellie's egg, of course! Eggs are the perfect starting point for any delicious breakfast dish: a good source of protein, a versatile ingredient that can be used in sweet or savory dishes, and satisfying enough to create a hearty dish with or without the addition of meat. And if you're going to cook with eggs, make sure they are Nellie's Certified Humane Free Range Eggs! Nellie's Eggs are Certified Humane(R), free of antibiotics, contain no added hormones, and are produced by hens that are never caged and have access to the outdoors. Nellie's is also a big supporter of small local and family farms, which will make you feel even better about celebrating the most important meal of the day during National Breakfast Month with them! Now, back to these sandwiches... I LOVE a BLT! Crisp lettuce, salty bacon, and sweet and juicy tomatoes is such a simple and delicious combination of ingredients. 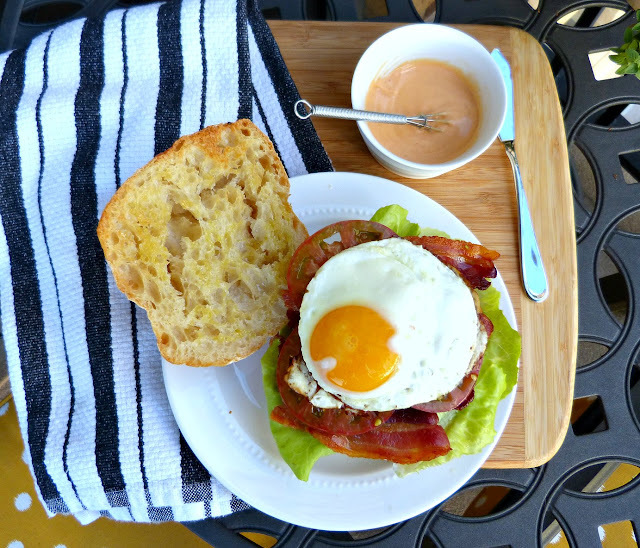 I love adding a little zip to my BLT sandwiches and usually add a little Dijon mustard, but I created an easy sriracha mayo for these sandwiches that is spicy and tangy and adds an amazing layer of additional flavor to this sandwich. And a simple sunnyside up egg (with a runny yolk) really rounds out these BELTs and turns them into a tasty and substantial sandwich you can eat at any meal. And you may think that an egg is an egg is an egg, but look at the gorgeous color on these yolks! Nellie's eggs are the real deal and you can taste and see the difference. In a small bowl, whisk together mayonnaise, sriracha, and lemon juice until fully combined. Cover and chill. Heat a griddle or large frying pan over medium high heat. Spread 1 Tbs. butter over the cut sides (inside) of each roll. Place on the prepared griddle or pan surface, cut side down. Remove after 3-5 minutes, once lightly toasted and golden brown. Heat remaining butter in a medium nonstick pan over medium heat. Crack the egg directly into the pan and cook until the egg whites are set, 3-4 minutes. Spread the sriracha mayonnaise evenly over the toasted sides of the rolls. 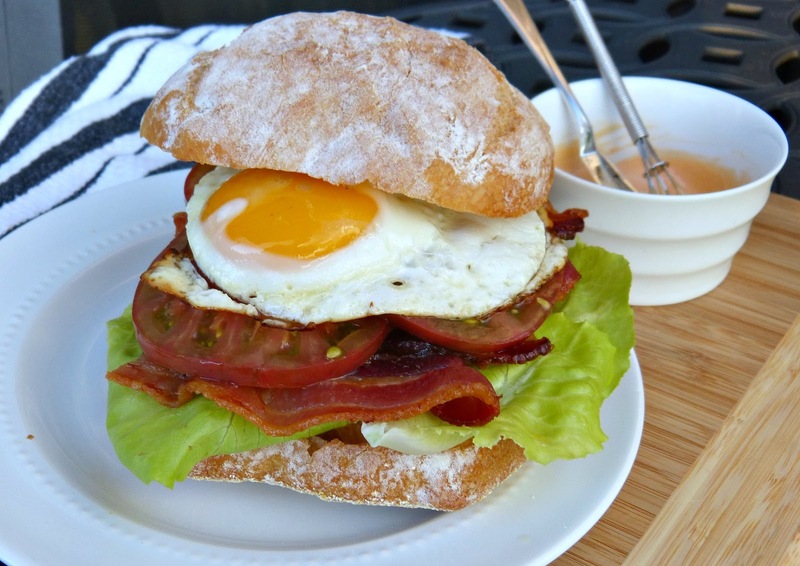 On the bottom half of each roll, layer lettuce leaves, bacon tomato slices, and one egg. Editor's Note: Complimentary products were provided to me in order to facilitate this post. The opinions expressed herein, as always, are my own.